Brand New Wallenstein Model QC600 Skidsteer Mounted Backhoe. * Price includes 12" Bucket & Hydraulic Hoses! * Comes painted Black as shown in the photo. * Boom Length is 4'- 0" from the Back Frame to the Bucket Pin. 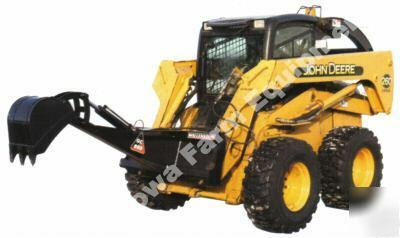 * Approximate Reach Height is 12 feet, but varies with skid-steer. * Buckets have replaceable teeth. * Uses Skid Steer's auxiliary hydraulics for the Hydraulic Source. * Pivot Points have Grease Joints and the Bushings are replaceable! * Availability can vary from 2 Days to 3 Weeks.